I have never been to an Aladdin's Castle (have always stayed in mah local Sears arcade) so I really want to know what the experience was like, what memories you guys had, etc. Also discussions about Gold Mine, Bally LeMans, and other Bally-owned arcades can go here. First question: Aladdin's Castle opened up in 1974. For those of you who are old enough to remember, what was it like at the first ACs? There was one at the Lansing Mall, I think. The manager was some Tim Burton-looking dude. I recall cutting my teeth on the fighting game genre there, learning how to chuck fireballs, duck while blocking, all that stuff. It was a neat time to be alive, discovering all this stuff we're now extremely familiar with for the first time. Aladdin's Castle started in 1974? I was BORN in 1974! Video games were brand new back then! What the heck would they have to play? I went to one in 1976. They had harsh overhead florescent lights. And an unfinished grid work ceiling painted in white. Much of the center area was open space, white speckle-peppered tiled floor. Nondescript, much like Toys 'R' Us of the day. This one was more like a longer hall, about the size of a standard 40-lane alley. One one side they had plenty of Skee-Ball machines, and on the other some horse racing games and plethora of other mechanical games. The uber cool helicopter game, the mechanical Lunar Landing simulator. A baseball game with a real 3" wood bat and players that would pop-up out of slots in the pinball-like playfield. There were few videogames at that time. And the ones they had were B/W. I only vividly recall Sprint2. But they had some Tank and Pong cabinets. A tennis game, and something with a periscope. It was clearly a place for high traffic. And it really looked like a castle. Very much like Dispensa's. The place was full of druggies and Heroin shooters and smoke was everywhere. Full of those free-love hippies with long hair. But it was cool. It scared my parents though. One time something happened and they scooped me up and ran out and we never returned. I clearly remember smelling weed at the establishment. It was exotic. Not like white cigarettes. Since we clearly weren't going back to the only arcade in town, I told my parents I wasn't going to behave no more in school anymore unless they bought me videogames to play at home. They gave me lip about how I had no choice in the matter. I'd show them. I'd teach them! So I went to school and caused trouble enough they had to come collect me. This went on for a week or two. They caved in and got me the mechanical Marx T.V. Tennis game. It was pretty cool. It made a hell of a racket (NPI) with all noise from the motor and the arm hitting the bell. Drove everyone nuts. But I was smart and used that as a bargaining point to get me a real electronic Pong console with real circuits and a proper volume control via the TV set. So I ended up with an Indy 500 by Video Action. I taped my pocket calculator to it and my AM radio kit to it and added some random lights. I now had a control panel right out of Mission Control! I was in the SpaceAge! I even conducted circuit-bending on it and blew something out in the process. It was put out for the weekly garbage collection and that was that. I kept the Interton F-4301 chip. We moved. In the new town I got into model rockets heavily and launched them via rubber bands tied to the roof, at first. When they hit the awnings and gutter overhangs I convinced them to get me real rocket engines. And eventually I got a VCS and Apple II. And more electronics. It was now 1979 and soon enough a new obsession with Lunar Lander and modems would begin. And that was that.. The Aladdin's Castle I experienced in the 70's was completely different than what one might have experienced in the late 80's or early 90's. The one in the 1990's was posh by comparison, air conditioned, quiet, subdued, controlled. Kid friendly. Full of pumped-in Oxygen. Not the Wild West anymore. I remember going to one from 1992-1994 at the Crossroads Mall. Lot of great arcade games I remembered it had. Race Drivin', STUN RUNNER, Vs. Super Mario Bros, Vs. Goonies, Donkey Kong, Donkey Kong Jr., Mario Bros, Ninja Turtles, Turtles in Time, Galaga, Moon Patrol, and lots more. Some skee ball, Bozo's Grand Prize Game, and basketball shooting ones. It was a fun place and had some great memories there. I remember going to one around the mid to late '70s. It was my first encounter with the electro-mechanical gun games. The two Aladdin's Castles I went to (Waukegan Lakehurst Mall) and Hawthorne Mall in Vernon Hills were awesome. Waukegan was a little bit smaller and had a darker atmosphere. By the early to mid 90's, the Vernon Hills location became a lot more kiddie "friendly" and by that, I mean more prizes, crane games, redemption machines and a section of the arcade was cordoned off with some picnic bench tables for birthday parties and such. 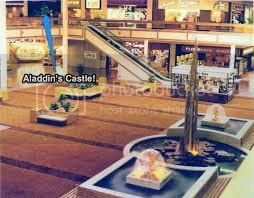 The two Aladdin's Castles I went to (Waukegan Lakehurst Mall) and Hawthorne Mall in Vernon Hills were awesome. The Lakehurst location was my main hangout. I also spent a fair amount of time at the Hawthorne and Belvidere Mall Castles. To the previous poster, there were plenty of EM shooting and driving games in '74, in addition to pinball. Oh yeah, how could I forget the Belvidere Mall?! Great little place (kind of an indoor strip mall really) at the time. Remember my Mom would take us to see movies there. Chariots of Fire and Clash of the Titans were two I recall. First time I ever saw Dragon's Lair (w/ a monitor on top of the machine so others could watch) was at the Belvidere Aladdin's Castle. It's a shame what happened to both Waukegan Malls. Belvidere turned into an ghetto flea market by the early 90's, but there was a friendly video game dealer there that had a decent price on a Neo*Geo system that I sprung for. Those were the days! Great postings, guys! You can also post about Gold Mine, Go Bananas, Bally's LeMans, Just for Fun, and Games People Play! Things called pinball machines which were around long before Space Invaders and PacMan. My uncle took me to an Aladdin's Castle in the mid-70s because he wanted to play pinball. It was in a Dallas, TX mall ... maybe Northpark or Valley View. I was a little kid, so I don't remember much except for the pinballs and two video games: Bally Gunfight and Atari Football (with trackballs). The latter seemed infinitely complex and cool to me. Hey, in the late 70s-early 80s, did AC have Xenon? That's one of my favorite pins. We had a Bally's Tom Foolery near us (Arlington Heights) BITD that was a blast. Still have a menu from the place, I'll take a pic of it and add to this post later. Nice restaurant with a largish game room in the early 80's. Then there was the Ground Round I have fond memories of in Dundee, where my parents would go and have a drink or two before taking us to Showbiz Pizza right next door. In the bar, were DK and Pac-Man and you could throw your peanut shells right on the ground. Showbiz was always awesome, but Ground Round was definitely a treat in its own right. My only distinct memory of Alladdin's Castle was playing a Major Havoc machine that had the volume turned up WAY to high. 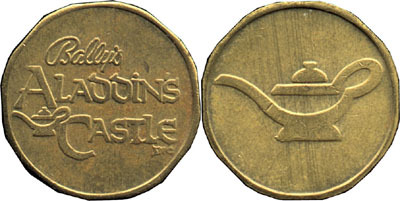 Aladdin's Castle used to sell these filled with tokens to give as gifts. I got this one as a Christmas present...I'm thinking '81 or '82. Their tokens were normally gold colored but for some reason one was silver and I kept it for good luck. The GROUND ROUND! I was little enough to think it a sophisticated night-club & lounge. Loved going there to stare at the wiminz. Wasn't there one on Roselle Road that eventually becam Down The Hatch? And then something else, too, later..? The arcade I describe in post #4 was in California. And I'm pretty sure it was an Aladdin's Castle. It was a stand-alone establishment. I'm just dyin' to open up the family time capsule made in 1985. It's scheduled for 2020. And I know I put a lot of my pictures in there. As a kid I had a joystick in one hand, camera in the other. Walk into any mall video arcade. It was pretty much like that. My ONLY memory of Aladdin's Castle was playing Zaxxon and Dig Dug. This had to be around 1982. It was cool, but I preferred my precious Sears arcade. I recall both what we called the "Sears arcade" in our old mall in Tupelo, MS, as well as the Aladdin's Castle in the newer Mall at Barnes Crossing (also in Tupelo). The Sears arcade was the quintessential mid-80s video arcade, with a pinball machine or two, and a number of classic arcade titles from the time, mostly Atari and Namco games with a few from Sega scattered here and there. When the new mall opened in the late 1980s, the Sears arcade shut down shortly afterward, of course. Aladdin's Castle also had a number of vintage games when it first opened. They moved Ms. Pac-Man, Galaga, and Centipede over, and they added another pinball machine to the collection at the time, but they started getting in some more modern titles (for that time period). So in came Klax, TMNT, NARC, a Nintendo PlayChoice10, and a fair few other games like that. 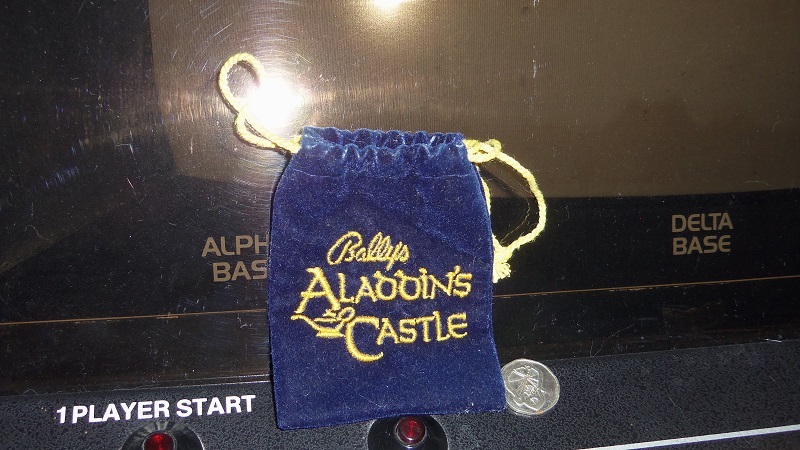 The Aladdin's Castle did keep the old skee-ball machines, a basketball redemption game, and a few others, however. As time went on, more modern games came to replace the older, vintage games. Ms. Pac-Man and Galaga stayed around the longest until they were eventually retired and replaced with a single Ms. Pac-Man/Galaga 20 Year cab. The arcade is still open, today, but has been renamed to Time Out (same old logo, none of the old games). The only vintage game left is the aforementioned Ms. Pac-Man/Galaga cab. No pinball machines are left, and about 70% of the games are all simple redemption games that I find almost no interest in at all. To their credit, they do have a Terminator: Salvation game which, for a modern game, is quite nice. Time Crisis 2 and 3 are present, still, and a few racing titles are there. But that's just about all we have now. To end on a bright note, one of the old games that Aladdin's Castle had years ago has come into my possession. I've written about it on another thread, but they had a Bally/Sente SAC-1 cabinet (I think originally a Gimme-A-Break if the very light burn-in on the monitor is any clue). It was converted to a number of games over the years, first to a Sega Crackdown, and later after that, a Seibu Dead Angle, which is the game in it today in my shop. The Dead Angle game works fine and all, but for my purposes, since all the original boards in the machine are long since gone and probably would never be found again, my goal is to convert this guy into a MAME cab where it will see much more use. Still, it's nice to know I've got a little bit of arcade gaming history from my youth from the very arcade I frequented as a kid. These are the tokens I remember. I still have a few of those, too. But after the arcade was renamed Time Out, they started using Namco tokens with Pac-Man on them instead. Edited by rockman_x_2002, Mon Aug 17, 2015 12:39 PM. I was at Niagara Falls and they had an arcade that had Aladdin in it's name, it might have been an Aladdin's Castle. Arcades used to be great but sometime in the mid to late 90s, they ditched all the video games and pinball for ticket redemption machines, and I haven't been back since.